This is a blog of my experiences with dogs -- as an owner and as someone who worked with them professionally. Hopefully what I've learned from my experiences will also help you with caring for your own dog. I’m excited to share something new that I recently learned! Not long ago I was sitting on the floor with Leopold, giving him a head massage and rubbing his ears, when he decided to give me kisses. ….Stinky, smelly, eau de dead-animal, rotten kisses. Bleh! We’ve been putting up with bad doggy breath around this house for a while, but it was then that I decided to finally try something I had read about a while ago in a book: adding a little parsley to a dog’s food is said to help fight bad breath! (I’ve heard it works on humans, too). We’ve been putting parsley on Leopold and Halo’s food off and on for the past week or so. Every time we put parsley on their food, their breath is noticeably better! And their breath goes back to being kind of stinky the times we forget to add parsley. The parsley seems to be a bad-breath-exterminating success! In addition to now being able to withstand being in the same room with my dogs when they yawn, I can also feel good about adding some extra nutrients to their food. Parsley is a source of vitamin C, vitamin A, calcium, magnesium, and iron. Some think that it may even help prevent cancer! 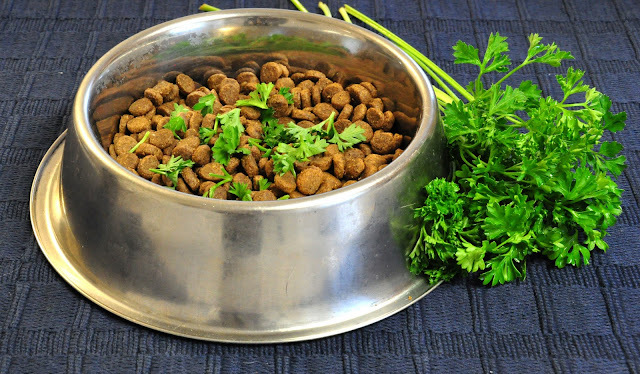 I plan on making parsley a daily addition to my dogs’ meals from now on! Brown, Andi. Whole Pet Diet: Eight Weeks to Great Health for Dogs and Cats. New York: Celestial Arts, Crown Publishing Group, Random House, Inc, 2006. Print. I recently stumbled upon parsley's anti-inflammatory properties. Do you have any references for safe amounts to feed dogs? Hello! My name is Laura. I am currently a stay-at-home-mother caring for one wonderful little boy, two pound puppy mutts, and of course one grown and very handsome man who would be oh-so lost without me! Though... I would also be lost without him, so thank goodness we have eachother. My interests are endless and include much of the natural world, but I suppose the three main things that define my life so far are ecology, dogs, and art. Like what you read on my blog Leopold's Crate? Follow me to receive updates of my posts! Fun activity for dogs who like to "disembowel" their stuffed animal toys. Dog potty training tips: try a crate! A fun dog activity: Newmans Own brand treats + Hol-ee ball! What do you do when an off-leash dog charges at you and your dogs? Laura is a participant in the Amazon Services LLC Associates Program, an affiliate advertising program designed to provide a means for sites to earn advertising fees by advertising and linking to amazon.com. The commission Laura may receive as a participant of this program helps to support Leopold's Crate and it's goal of helping dog owners to improve their own dog-owning experiences.